*Disclaimer: Stk# KN521765, MSRP: $43460.00, Dealer Discount of $6,000.00, Chrysler Incentives of $7000.00, Price does not include taxes, dealer installed options, and license fees. Additional Chrysler Incentives may be available depending individual qualifications. Offer valid while supply lasts. See dealer for more details. *Disclaimer: Stk# JPJ33731, MSRP: $25810.00, Dealer Discount of $3315.00, Chrysler Incentives of $3500.00, Price does not include taxes, dealer installed options, and license fees. Additional Chrysler Incentives may be available depending individual qualifications. Offer valid while supply lasts. See dealer for more details. 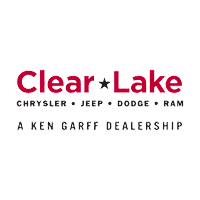 Whether you need a capable, tow-ready 2019 RAM 1500 or a spacious 2019 Jeep Grand Cherokee, you’ll find it at Clear Lake Chrysler Dodge Jeep Ram. Our inventory of 577 new Dodge, Jeep, RAM, and Chrysler vehicles for sale in Webster in the Houston area. Explore our inventory of new Dodge SUVs, Jeep SUVs, RAM trucks, and Chrysler cars here, and use our filters to browse by price, trim, color, and more. If you find the right new Dodge model for you, get in touch with us to arrange a test drive. Where can I find the current incentives on new Chrysler, Dodge, Jeep, and RAM vehicles? You can find all of the current national incentives and offers right here on our national offers page. If you’re also interested in lightly used pre-owned vehicles, look no further than our retired demo loaner vehicle inventory. Can I get financed for a car loan if I have bad credit? We understand your concerns about being able to get financing for your vehicle purchase. Our finance experts have a lot of experience helping drivers with all sorts of credit situations, so even if you have poor credit or no credit, they will do their best to help you. If you want their help, fill out our secure online credit application. What should I do when I find a vehicle that I want to test drive? You can schedule a test drive online through our website. You can also call our sales staff directly to set up a test drive. Our dealership is located in Webster, so we serve customers from all over the Houston region — from Clear Lake to Pearland and beyond.